NOTHING TO DO WITH TATTING AGAIN! 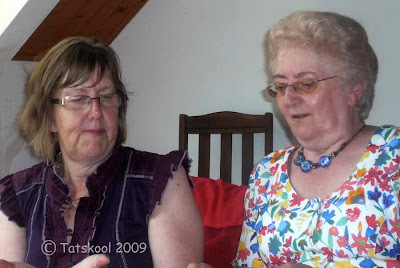 I have been 'told' by Sally my VIT that I should tell you the story of the Pink Elephant! I am like many, many women 'right/left challenged'!! That is we have difficulty deciding which is right and which is left. This affliction really only affects me when I am stressed and there can be no more stressful situation when you need to know your right from your left than driving a car. Especially when your better half starts shouting "LEFT.... I SAID LEFT!" I suspect that's why I failed my driving test first time when I went right instead of left! I remember as a child having an inoculation at the top of my left arm, and from then on for many years I had a sort of sixth sense sensation in my arm whenever anyone made me chose left or right! The trouble is that as far as I am concerned the words right and left are man made and don't actually mean anything to me. If someone says dog then I can picture a dog...but I can't picture left...it could equally well be right! Right is obviously easier than left and never gives a problem...because I write with my right hand. You could say that left is the hand that I don't write with, but involves a second brain process and there just isn't time for that when someone shouts turn left! (He says that he doesn't shout!...he just gets a bit stressed!). This is my car, my beautiful blue car...be in no doubt about how much colour affects me. Whenever I get into my car I immediately feel good...and that can't be bad. I waited to get this particular colour..turning down red and silver which were easy to get. You can't see this but the pots in my garden are colour coded with my car! 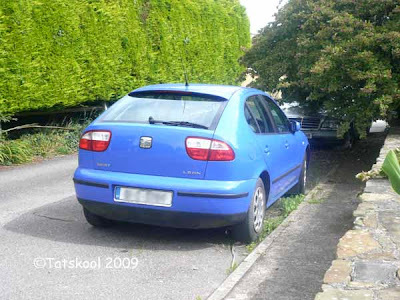 My car used to live down the drive and our 1971 Volkswagon Variant was parked on the road. But when the old car was towed away to a better life, I moved my car out to the road knowing full well that somebody else would park their old wreck in that spot if I didn't fill it. 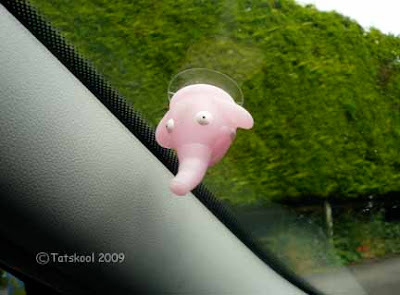 What you can't see in this photo is that inside the car attached to the windscreen is ...wait for it...a pink elephant! ..now isn't that the cutest pink elephant you have ever seen!! He was donated to my car by my son in the interests of safety! I am sure you have already guessed his function. Yup whenever himself wants me to turn left he just has to say "Elephant Way!" (if he remembers that is) and it will be done. After all I can SEE an elephant!! Now isn't that clever! We do also have "non elephant way" but that's taking it a bit TOO far! So what about the second part of this post....the Sat-nav! Well, hubby for some reason known only to himself thinks that I am a rotten map reader. I can't imagine why..we always get where we are going. I don't really like map reading. Again like many women I have to turn the map upside down if that's the way we are going, and the left/right thing doesn't help! And soooooh, one day a few years ago we were walking down the main street of the town where his dad lived, when hubby suddenly became serious. "I have been thinking" he said, "I am either going to have to get a Sat-Nav...or a new wife!!!" "and" he added, "I think it would be easier to learn how to use a Sat-Nav than to train in a new wife!" And so he bought his first Sat-Nav and the pressure was taken off me or so he thought. The first setting was fine, we navigated to the rural pub to meet his sister. Next day we left for the ferry a long way away. 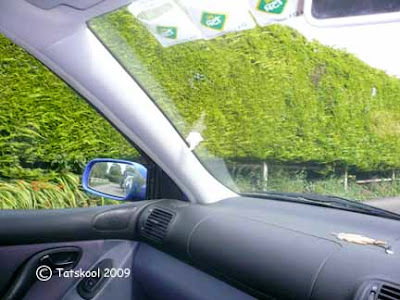 Sat-Nav was set but herself the Sat-Nav lady insisted on telling us to "make a U-Turn when possible". Pulled into a lay-by and reset it..to no avail... "make a U-Turn when possible", was all she would say, and the same thing happened everytime he stopped and tried again. The instruction manual was no help....so while he was trying figure out what was wrong....Didn't I have to navigate (we had a ferry to catch)...proving that it wasn't easier to learn how to use a Sat-Nav than to conserve the wife you have! !...and didn't I do a better job. Finally many miles and attempts later...it became clear. At the final part of the setting it asked..."do you want to cancel the current route?" Well of course not or we wouldn't have set it would we!! Turned out that the current route was the old route!! so she was constantly trying to take us back to the pub from the night before!! This same Sat-Nav was chosen because it did actually have a map of Ireland...but it stops short 5 miles from home and thinks we have gone into a field! That's true of everywhere but the biggest cities. A new Sat-Nav was bought in frustration this summer and it is super..it even has our road marked tho' it doesn't acknowledge it's existence! It was super travelling through UK...the estimated arrival time was so accurate and we had constant updates on traffic delays and would be offered a shorter route. It's still not as good tho' as the American system we had on a hire car in Chicago. That contained the entire yellow pages and could take you anywhere, so finding an Hotel was a doddle. Have to get back to my tatting to get some tatting content in here again. A VIT....Very Important Tatter....of course....came to visit me last Saturday. This is the second time that we have met....the last time was two years ago. Timing was against us last year so we didn't make it. So who was my VIT?? 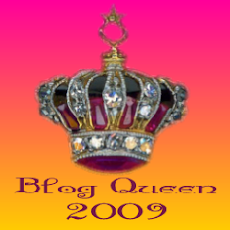 If you have been commenting and reading my blog comments, you will already know! She is none other than TatsHeaven, otherwise know as Sally, you may also know her as the little sister of Tatting and not a lot else. She has been coming to Ireland every year recently and stays not much more that an hour away from where I live. It wasn't Tuesday, so we had to make do with Tatting Tea Saturday....not that we did any tatting...too much talking to do! But we did eat some very delicious chocolate cake that I had chanced upon......It's always a relief when you find that a tatter really does eat chocolate!! After a big...haven't seen you for such a long time...hug it was down to business!! She had brought some of her tatting to show me...and even gave me a piece....very nice too. 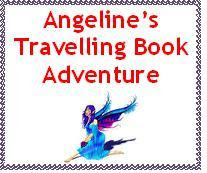 It is a design that she is working on so I guess I better keep it under wraps...unless she says that I can show you. But it will go into my other tatters tatting collection! She saw all my latest work and was very interested to see my dyeing studio and see what a long winded process it is. 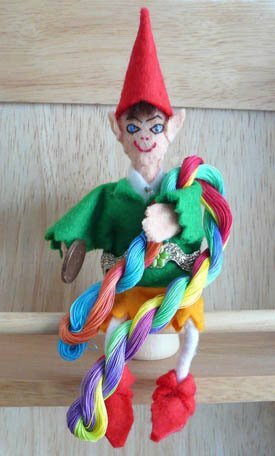 She thought that my HDT looked much brighter in the flesh and she thought that Fergeal the leprechaun was much smaller than he looks on the blog!. He is quite a shy little chap really and was just sitting watching and minding his own business...for once! My hubby and her hubby have a common interest in clocks and watches so they entertained themselves. Her hubby even performed a miracle on my favourite clock that had been deemed a right off....it's still going! Hubby was given the task of taking a 'decent' photo! One that we would both approve...and he did ok. Here she is taking 'a gander' at my geckos..
...let me tell you that TatsHeaven is a delight! and I hope to see her again...next year. Well I had to say that didn't I or big sister might fly over on her broom stick and........! Only wimps need sat nav to find a tatter!! Our new sat nav actually has our road on it..even tho' it wont acknowledge it's existence!! Out last sat nav was under the impression that we had driven off the road into a field when it got within 5 miles of where we live. At least this one shows it...but who needs a sat nav, sure doesn't everyone know where we live!! But shhhhh! don'tell anyone else! Does anyone else suffer from the terrible addiction of postman watching....ie watching for the postman...not actually watching the postman per se!! Here follows a dissertation on the postman so if you are only here for the tatting, please go straight to the photos!! 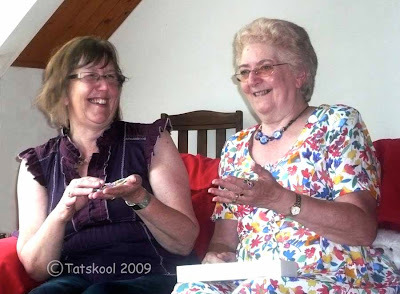 Everybody else settle down with your cuppa...you may already have one in your hand if you are reading this on tatting Tea Tuesday...in which case you should be tatting!! When I was growing up in England I never had this problem. I would come down to breakfast and there would either be post on the mat or there would not....and that was that... I knew exactly where I was!...except at Christmas when there would be a second post to anticipate. When I came to live in Ireland 38 years ago all that changed. Those were the days when we got real letters....from our parents every week without fail...posted sunday afternoon and we got them on thursday. Let me tell you about my postman...I will call him 'Shamus' to preserve his anonymity! He was my postman for at least the first 25 years. 'Shamus' would walk the couple of miles to the little local post office/shop (now sadly no longer a post office)early in the morning and sort the mail for his route.....and off he would go. Rumour had it that he had had polio as a child and couldn't manage the bicycle that went with the job and so he walked or should I say trudged in wind and rain, hail and snow. It wasn't all that long a route, maybe 5 to 10 miles, but it was up and down hills and a lot of the houses have very long drive ways..often up more hills and no one had a post box at the bottom of the drive in those days. He would leave his second,often heavy sack of parcels....yes he carried most of the parcels too...at the bottom of the drive and trudge to the door. So this was one thing that made his delivery take so long but there was another factor! 'Shamus'had 'ports of call' on his route! He would ring the doorbell and ask for a drink of water! I was warned about this when we came to live here so that I could decide which route I would go down! Some people offered him tea and whatever cake and scones and jam they had and of course they became his regulars....some gave him water and they didn't become regulars.....I gave him orange juice! Every so often he would ring the doorbell with the rain dripping off the end of his nose. He looked so tired and weather beaten that I couldn't help but feel sorry for him ..it was obviously very thirsty work. But I knew that once I invited him I would be one of his regulars. So he would stand in the porch and gulp it down. Mostly tho' between gulps, he liked to gossip, he could tell you everything about anybody. Trouble was that he had such a strong accent and he mumbled that I really couldn't tell what he was telling me!! And so as we were near the end of his route we would be lucky if we got our post by 2.30pm....if it was a special day like Valentine's day or he had leaflets to deliver to every house then we would maybe have to wait until much later. Coming up to Christmas it could be 6pm before he arrived. Just before Christmas they would split his route and we would be back to normal! When he had finished he would walk home. I would often come across him as I drove to my Brownie pack once a week. There he would be bent over carrying his empty sacks trudging along. So I would give him a lift....and be treated to the latest gossip which I couldn't understand. As long as I just nodded we were fine. We never complained about our postal service, we didn't want him to lose his job and we never had anything that urgent...but others did. It was to be expected that if a letter was posted in the evening it would arrive next morning...not next evening and so people were missing out on job offers, appointments etc. They asked the post office to keep their mail and they would collect it themselves, way quicker. I think our postal service is one of the best in the world, we have no post codes and the bare minimum of an address will usually find us. I remember a friend getting a letter that was addressed to his name and just Ireland. What other country would take the trouble to find him and deliver such a letter. One day, to our amazement a Post Office van drew up mid morning and delivered our mail. 'Shamus' had retired...at last!!! !....but for several years he was to be seen every day out walking his route...that was his life. In 'Shamus's' time we wouldn't know until the end of the day if we had mail, had we missed him or was there simply nothing. So watching out for the postman was a days job! Even now when we usually get our mail by lunchtime....well it's still the same tricky route. The little post office closed and was transfered to the next village, now that has gone also and a bigger custom built sorting office does the job...but the route is twice as big!! I still can't help having one eye on the window, watching for the van...will it drive past or will my vigilance be rewarded. ....and so it was one day a while ago. What should i find in my porch but a card from my new friend Suneeti. Now isn't that a pretty peony card to get. Suneeti lives in Dublin and was taught to tat by her aunt and grandmother when she was nine years old. Like us all she doesn't meet many tatters and has learned modern techniques from the internet. 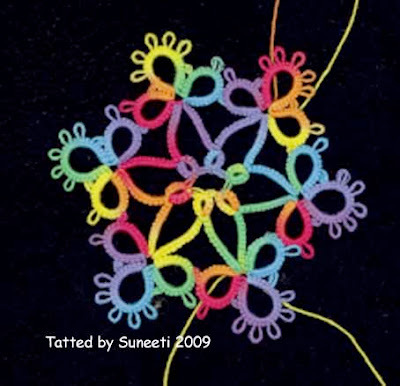 Suneeti's card was a thank you or introducing her to the world of hand dyed thread. But that's not all, she had included a lovely snowflake that she had tatted. I love the way she tied of the ends around the ribbon to make a hanger. Wasn't that a lovely thing to do, it's not that often that I get somebody else's tatting. I think I could still count the number of times using only two hands full of fingers!! I've looked at many snowflake patters, in books and on the web, and have never found this one. There's a story behind it as well. Nearly twenty years ago (!) we had a professor visit from New Zealand on sabbatical. His wife gave me a Christmas card with a tatted snowflake on it, in this pattern. I don't know if I still have the original card. But her card prompted me to dig out my shuttles again because I realised that I could do more than tat edgings for hankys and doilies (neither of which I have ever enjoyed). 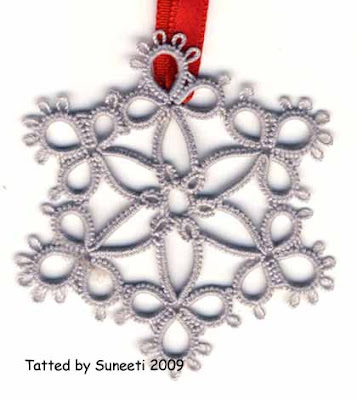 And so I began tatting snowflakes and little motifs to put on baby-onsies and t-shirts, etc. 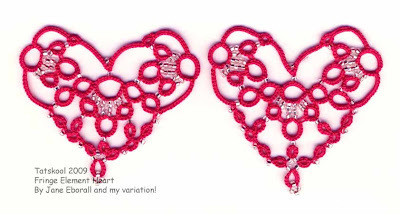 She said that she would like to share the pattern with you all as a thank you for all that she has learned from the online tatting community. But first I must ask..does anyone know this pattern, who the designer is???? I don't want to tread on anyone's toes. ...lovely isn't it?......ooooh don't go away.....gotta run....think I heard the Post Office van!!!! A good while ago I started to tat a different heart. 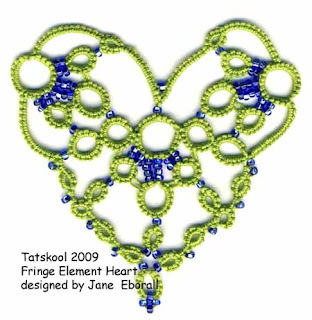 It's the Fringe Element Heart designed by Jane Eborall. 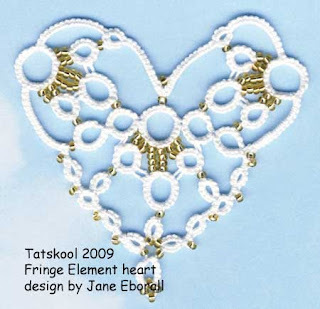 It was the arrangement of beads that attracted me to the pattern. I tried it first in Floretta 20 in a mid pink variegated colour...since I seem to be in 'pink mode', with silver lined grey beads. I didn't like this one bit! !......Some patterns are lovely with variegated thread, some not...and this didn't appeal to me at all. Maybe it was just this particular thread...not one of my favourites. Having said all this it actually doesn't look too bad anymore!! I liked the effect of the beads, so used them again with Flora 20 in mid pink. I like this a lot better as the thread doesn't detract from the design. Next up is Flora 20 again in lavender with transparent rainbow grey beads....very pretty. The next one is my all time favourite. Deep candy pink Flora 20 with silver lined crystal beads. You can't imagine how much those beads sparkle! 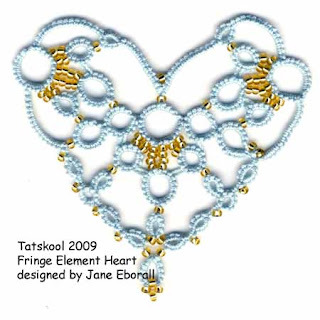 I made another one like it and sent it to Tatting Chic to cheer her up and apparently it did...she blogged about it on June 29th...was it really so long ago!! Another.....totally different colour this time....coats 20 in lime green with silver lined deep blue beads. This one is quite stunning too. The heart takes about 3m on sh1 and about 3.5m on sh2 in size 20. It's quite a tricky little pattern, tho' it was no problem to me...once I had concentrated enough! 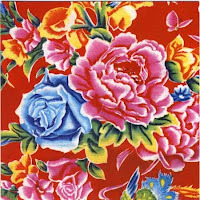 When I gave it to my tat ladies some of them found it very hard...one of the hardest patterns I had ever given them. It has lots of rings off split rings with the bringing up of beads as you keep returning to the split ring. But with a bit of practice it is well worth the effort. Now for a slight change of tack......once I had cleared my desk unit for my scrapbooking space.....and actually had room to spread my things out....again! 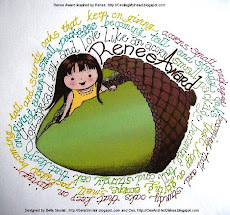 !....I was determined to finish my next scrapbook page that I started way back in early summer. 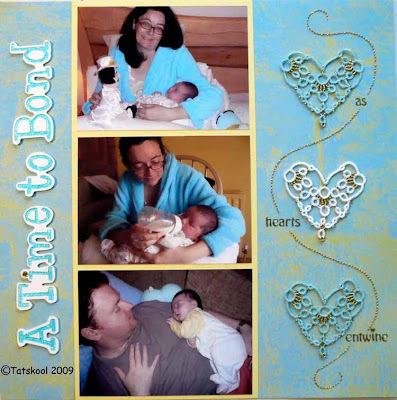 It's all about the bonding that takes place in the first few weeks when you have a new baby...and a light went on in my head.....tatted hearts of course as part of the layout. Three more hearts later and a huge amount of help from daughter and the page had taken shape...I just needed to finish it!! Ta da!! here it is! You can't imagine how proud I am of this achievement. I think that scrapbooking is the most difficult craft that I have ever attempted. If I could say that I planned this all by myself I would be even more proud. Yet it looks so simple when you get it right. "that's beautiful - I want to copy it now....."
....and she the scrapbook queen.....She inherited all the genes from me that never made it to the surface in my life. We made so many things together when she was a little girl....which all show now in who she is. 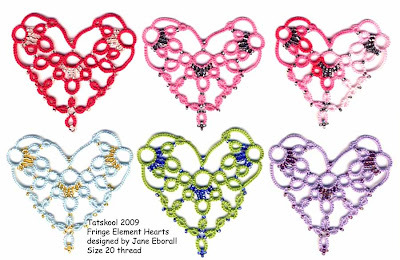 Let's have a closer look at the hearts..
...you can click on them to see then enlarged. The stitching is done with Coats Ophir my favourite metallic thread. OK if you can stand to look at more hearts, I will show them to you individually. Robin's egg blue Flora 20 with gold beads that really sparkle. The white heart for the baby is really beautiful..i forget how beautiful white is....to me white has become raw HDT!!! One final collage of my hearts and you can go!! 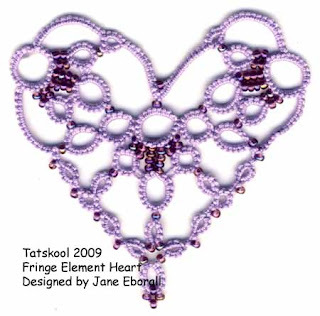 I haven't tried this pattern in a finer thread as I thought it was in scale with the size 11 beads. All your comments will be read...again and again ...so please keep leaving them. It's just a couple of clicks away and it means a lot. I had soooh many lovely comments on my attempts at fashion that I just have to give in and post a picture. I just have to quote part of the comment left by BugGirl(who sounds like a girl after my own heart with a name like that!). You have such a flair for color coordination and making things classy and elegant even with bright colors. There needs to be more bright colors in fashion today! I think people are scared of them, but you prove they can look so right. Have you thought of going into business helping people with fashion? Boy did she make my YEAR!! Just goes to show what a very un-fashion conscious T-shirt and jeans wearing, ageing, tatter, can do when she tries! At this wedding I did actually get a lot of compliments on the outfit and the tatting,partly from relatives who know about my tatting...including my niece who I taught long ago...but also from people that I didn't know who could see how much effort had gone into personalising it. Gone are the days when the comment 'did you make that yourself!' use to be a bit of a out down. Long ago when my kids were small we chanced upon a button badge making session at the library. As usual when stumped to come up with a design my mind went blank...so I drew the simple flower that I always draw and added the caption Yes I did make it myself! mmmm I must still have that somewhere. Ok Ok..you want to see the photo, I know. You know that I hate photos of me don't you, so this is a big concession. Can you see the feathers on the fascinator? Do we have to suffer to look great...they weren't even very high. In the end I had to change into my raspberry sandals as my ankles were so swollen. This does not bode well for the future!! The rest of the holiday was action packed. 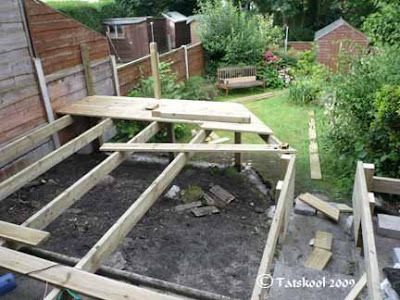 Hubby had agreed to help son to build a deck in daughter in law to be's garden...now their garden! He had already done a lot of the hard work in preparation. 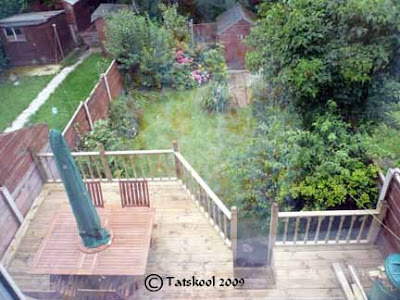 You can't really see just how big it is, there must be another 4 feet between the table and the house. 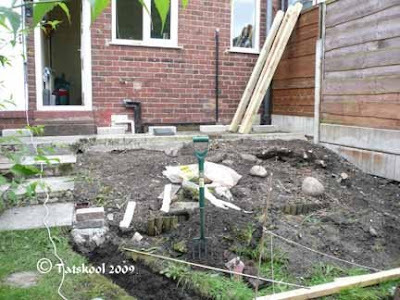 What a difference it makes to this lovely city garden. 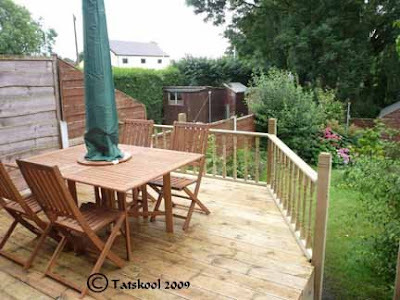 These two lads could get a job as professional deck builders any day!! After 6 day of dodging the odd shower, with fingers constantly crossed that the heavy rain always forecast wouldn't stop them in the limited time that we had, they announced at 4pm that it was finished. 5 minutes later the heavens opened and it didn't stop raining for days until we were safely back in sunny Ireland! 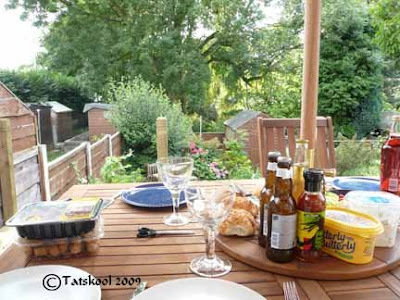 Fortunately son had been unable to wait to get out the new deck furniture and have a BBQ, that we christened it the night before it was finished and the railings added. We did so much....daughter in law to be and I shopped for wedding invitation supplies (any excuse to go into craft shops!!) and made the invitations...can't show you yet..still under wraps. 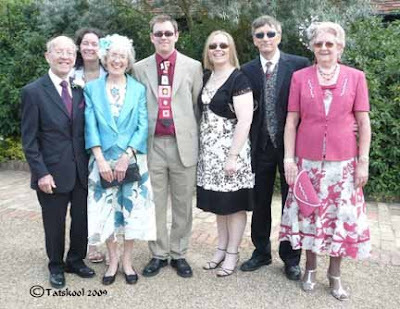 Her parents came to meet us(how daunting) and they are such lovely people....and we all got to go and see the wedding venue, which is fab. 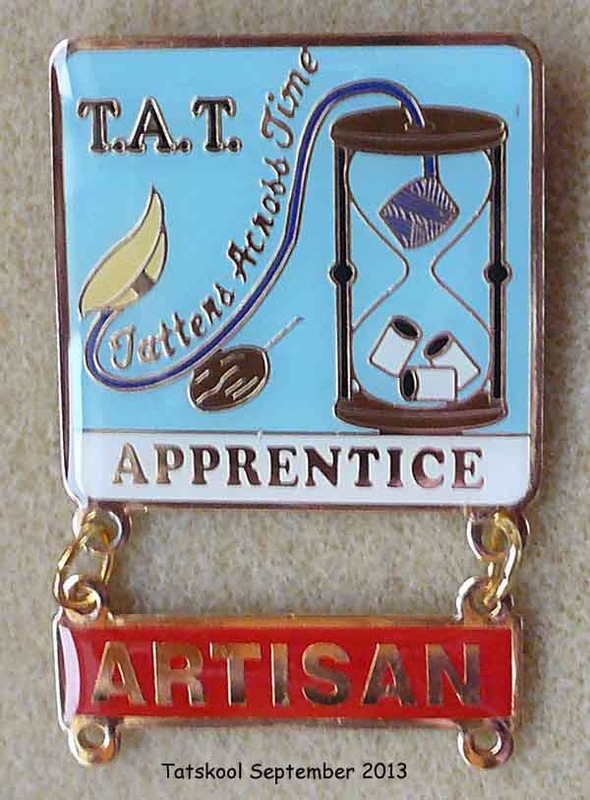 I didn't lift a tatting shuttle for nearly two weeks...this must be a record...I don't know what came over me. 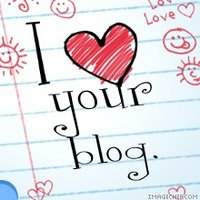 I value each and every one of your comments and referrals to me on your blogs..they really spur me on.....please kepp leaving them...but could I please ask you to not to use my real name.....particularly my full name.....Thanks.